Denver (2 October 2012): DISC Archiving Systems B.V. (“DISC”), market leader in professional data archiving, announces the software support of StorageQuest Archive Manager (SAM) for the new DISC ArXtor Series. 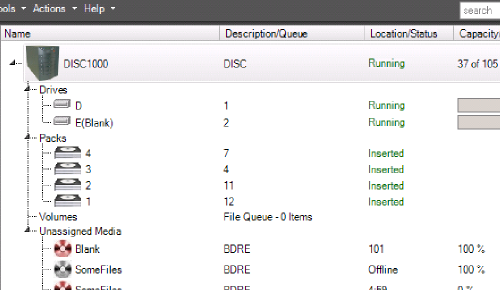 The StorageQuest Archive Manager (SAM) is a low-cost optical library management application built using today’s leading development tools and technologies. 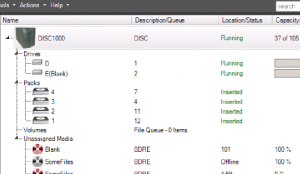 A newly created sophisticated Graphical User Interface (GUI) runs on top of a mature and widely deployed StorageQuest core UDF Device Drivers and Robotic control modules to create a fully featured, flexible, powerful, and automated optical archive manager. The SAM application writes archive data in the background to Blu-ray optical media through the DISC ArXtor Optical Library. Archive data such as audio, video, medical images, financial records, etc. is automatically spanned over as many discs as necessary without any user intervention. Some of the powerful features in the software include offline media tracking & remote replication. DISC announced in the Spring-2012 the next generation of Blu-ray Archival Storage Libraries including iSCSI connectivity and Purpose-Built Virtual Appliance options to support a variety of industry leading middleware archival tiered-storage management solutions. 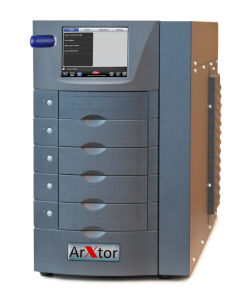 Engineered and manufactured in Germany, the new ArXtor Series continues with DISC´s long tradition of developing innovative, direct-attached automated optical library solutions. 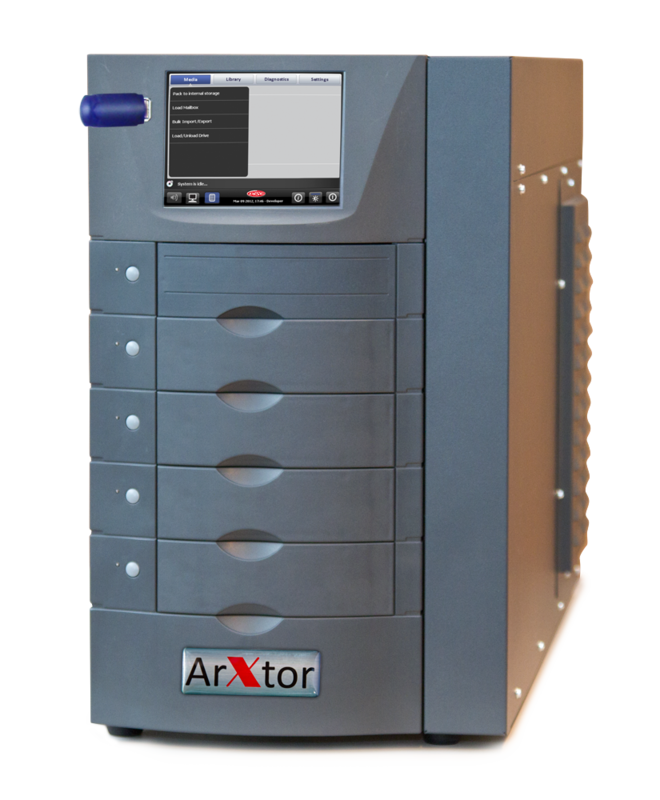 Mechanically based on DISC´s industry proven DISC Series “touchless media”, patented SmartPack and reliable robotics technology, the new ArXtor Series using industry leading Blu-ray optical drive technologies is a turnkey archival storage automation solution for managing 120mm optical media (BD/BDXL/DVD/CD). “StorageQuest´s Software Technology complements DISC’s new ArXtor Blu-ray iSCSI Libraries Series by providing a very cost competitive, ease to use/administer and a feature rich approach to data storage management,” said Mark Brown, VP Sales North-America of DISC Archiving Systems. “Both StorageQuest and DISC have been in the storage business for decades and this continued technology partnership highlights our ability to work together to not only understand the new challenges and demands facing the data-oriented enterprise, SMB and government workforce, but also to deliver fully automated long-term archiving solutions specifically tailored to meet the evolving needs of today’s customer IT infrastructures,” said Marwan Zayed, President and CEO, StorageQuest Inc.
“Data has been growing exponentially. Businesses and governments are realizing the importance of good data management practices and procedures with archiving a major component. An Archiving solution such as the StorageQuest Archive Manager (SAM) along with the new DISC ArXtor Blu-ray Library Series provides customers with a low Total Cost of Ownership to protect their valuable rapidly growing data for very long periods of time” said Brendan Lelieveld-Amiro, Director Product Development and Operations, StorageQuest Inc.